Jason Oremus and Jacobi Hall dance in Paradise Square. If the potent manifesto and all-star talent behind the scenes and onstage in Paradise Square don’t cause your pulse to spike with yearning for unity among people of divergent race, class, and ideology, check your heart. You are either asleep or in need of cardiovascular rescue. Berkeley Rep’s world premiere musical granted an extended run through Feb. 24 plays like historical fiction, imaginatively chronicling the 19th century history of the interracial, harmonious lives of Black and Irish Americans in Five Points, a 20-block slum in Manhattan. In 1863, the camaraderie of men and women who worked, danced, drank, caroused, and married interracially in Five Points was radically disrupted by the first federal draft. Irish immigrants called to serve in the Civil War and Black men barred from the military were equally outraged. The former wondered about being asked to sacrifice their jobs and lives to pledge allegiance to their newly adopted country, especially when white men of wealth could buy themselves out of service. The latter suffered evermore the pound-down-legacy of slavery, oppression, class stratification, and racism. The conflicts led to riots that destroyed Five Points and included the lynching of 11 African Americans, a death toll exceeding 500 people, and thousands of the city’s Black population left homeless. Paradise adds fictional layers with a dance-off to save a saloon, the harboring of a runaway slave, a songwriter who rediscovers his muse amid the very people his lyrics misappropriate, and more. Paradise’s animated staging of the complicated historical moment relies on unifying elements found in American composer Stephen Foster’s melodic songs and his partially imagined character. Woven like a tri-tone braid, the songwriter’s unquestionably racist lyrics, soaring melodies, and boisterous jigs and reels intermingle. 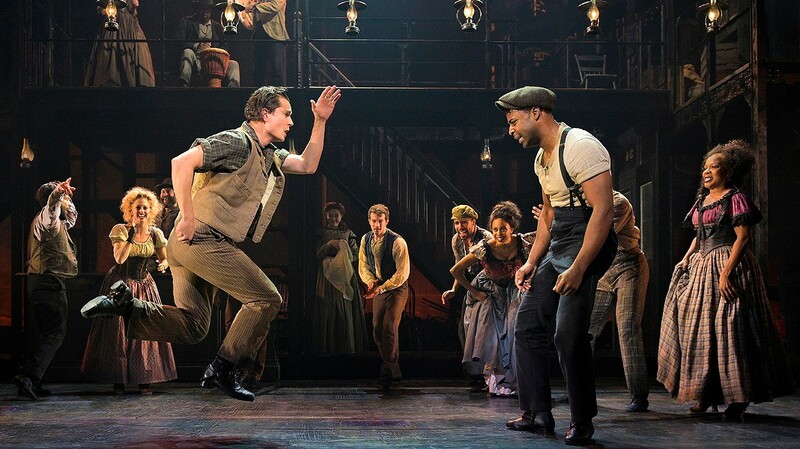 Layered throughout the 2.5-hour musical, dazzling choreography tells a sub-story through evolutionary dance forms: Irish step-dancing, traditional African Juba, African-American tap, among others. To mount Paradise’s dazzling array of song, dance, and theater requires an army, which the Rep delivers in full. Director Moisés Kaufman crafts the book by Marcus Gardley, Craig Lucas, and Larry Kirwan into a hefty, heartfelt narrative. Choreographer Bill T. Jones invites the rapid footwork and upright posture of Irish dance that rises from the soles of dancers’ hard shoes to serve as counterpoint to the bent-over, weighted movement of early tap, which in contrast emanates from the dancers’ torsos and ripples outward through hips, arms, legs, necks, and heads. Gradually, rhythmic crossover — bodies transformed to percussion instruments expressing power and pain — merges the traditions. Masterfully, the distinct character of each form is retained. Music by Jason Howland and Larry Kirwan, with lyrics by Nathan Tysen, is based on Foster’s songs. The updated gems, especially in adaptations of well-known songs, including “Oh Susanna” and a new-take “Janey With the Light Brown Hair,” feature Foster’s undeniably gorgeous melodies and brilliant rhythmic patterns with reimagined lyrics that replace the original, “happy plantation” minstrel style. Invisible to the audience, offstage musicians shine under music director/conductor Jason Howland’s capable supervision. Onstage, period costumes by costume designer Toni-Leslie James and scenic designer Allen Moyer’s convincing saloon and street settings are impeccable: balancing deliberate flaws, frivolity, and formality while establishing broad class divisions and fashion that reflects each character’s unique style and personality. Of course, actors are the last stop in determining a play’s heartbeat. Here, there are larger and smaller roles, but not greater or lesser talent. Christina Sajous as saloon-keeper Annabelle “Nelly” Freeman floats a golden, angelic voice above her character’s tough, earthy spiritedness. Madeline Trumble’s portrayal of sister-in-law Annie O’Brien is equal parts fun, formidable, and matter-of-fact — a remarkable trifecta. There’s the sturdy performance of Daren A. Herbert as Rev. Samuel E. Cornish; and nuanced deliveries by A.J. Shively as Owen Duignan and Sidney Dupont as William Henry Lane. When Shively and Dupont face off in several dance competitions — not only the final, most climactic one — the energy is electric, their chemistry a terrific combination of strength, tenderness, and boyish hooliganism. At times, Paradise stretches over-wide, the ambition of multiple plot lines and themes means the paint is thin in the outermost corners of the show’s broad canvas. For examples, issues of appropriation, white privilege, and gender and class inequities and exploitation are stated as realities, but lack development beyond the initial points made. While songwriter Foster/Milton Moore is strongly portrayed by Jacob Fishel as the tragic artist hero, Foster’s perpetuation of harmful, racist stereotypes and his personal weaknesses — preferring art and alcohol over his offspring — remains largely a minor, single-tone note. But perhaps the value of having too large a dream is actually the lasting message of Paradise. It leaves us to consider what matters, the principles and practices we live by, the actions we will or will not take to preserve individual freedoms, protect vulnerable people, and confront and counter inhumanity.